Last week I had a lot to blab blog about so I limited my information about book club to theme and decorations. This week I’m going to follow my own advice about partying, only I’m applying it to blogging. This is my “portmanteau” post, built on the one that precedes it. 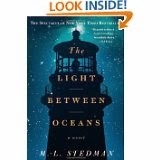 The book choice for this month’s Circle of Friends meeting was The Light BetweenOceans, M. L. Stedman’s debut novel. It might be understatement to say I loved this book, and the Friends were unanimous in their admiration of it. (A small spoiler alert, here.) To my great relief, the ending didn’t follow the traditional pattern of a tragedy. Not a doom-and-gloom ending, but a satisfying and hopeful one. And that’s my favorite kind. It’s a time-worn—but nevertheless true—adage: A little knowledge is a dangerous thing. Had I let my knowledge of tragedy discourage me from finishing this story, I would have missed out on a sparkling gem of a book. Now in an abrupt change of gears, let’s get to food. The Friends outdid themselves this time. One dish that got RAVE reviews was Paula’s Reuben dip. If you have a tailgate or football viewing party—or any kind of party—in your future, this is the perfect dish! Soften cream cheese briefly in microwave. Slowly stir in milk, mixing until well blended. Tear corned beef into small pieces. Combine all ingredients in a 2 quart casserole and bake 1 hour at 350. Serve in a casserole or chafing dish with party rye/rye bagel chips, or Fritos, or celery sticks. OR carve out a round rye bread to put dip into and use the rye bread cubes/pieces for dipping (not too small of course). I'm so sad I missed again. I actually read the book and everything. I liked it but didn't love it. It made me feel hopelessly sad. We missed you, Nicci. I always enjoy your insights on the books we read. The difference between my "love" and your "like" might be a matter of age and perspective. I can see this book being very sad to a mother of young children, and yet I saw such redemptive acts of love in some of the characters' actions. Oooh! Must add this book to my list. I know you're very busy these days, Sonia, so if your list is very long, shove this book to the top of it. :-) Among other things, I think you will appreciate the writing and will enjoy many of the historical details. It didn't sound like my type of book, yet I loved both quotes you pulled out - sounds like the writing itself has its own pull. Looks like another book on my wishlist AND and another dimple-popping recipe for my ever-growing collection. I'm going to have to have some mighty big parties to try some of this stuff! :) Thanks, Dee Dee!